I'm not an appy person. I could probably survive on a phone that makes calls, sends texts, checks the weather, and lets me post instagrams. I download a new app about once every three months, and it's usually something Elmo related to keep Ivy entertained during church. 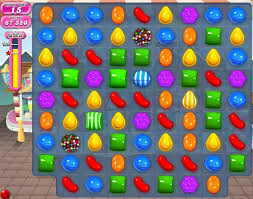 So I don't know what came over me, or what made me think I needed another distraction in my life, but for some reason I downloaded Candy Crush. Oh. Man. This game. THIS GAME. It's perfect. It's Tetris without the hassle of turning and placing pieces. It's Angry Birds without the required finger athleticism. It's puzzles on puzzles on puzzles and it's everything my jig-saw, cross-word loving soul has ever dreamed of. Have I sold you? Do you have the app store store open with your finger hovering over the free install button? Stop. Don't do it. It will ruin you. I used to be satisfied with my life. I was content to spend my days playing with my kid, walking my dog, working my challenging yet stimulating job, cooking dinner, talking with my husband and reading a chapter in a book before falling asleep. Oh how my life has changed. Now I spend my days looking for any excuse to crush some candy. The game has become my reward for even the least noteworthy tasks. "I emptied the dishwasher," I think to myself, "I deserve a treat." Five rounds of CC later and I'm having to pull myself from my phone to load the dishwasher or check messages or eat lunch,just to reward myself again after completing any one of those minor accomplishments. Watching movies with Stephen used to be a rich, rewarding cultural experience. Now it's a solid chunk of time where I can play my game, listen to dialogue and ask Stephen, much to his chagrin, about anything nonverbal I may have missed onscreen. Family car time has become Meg plays candy crush time.Like an alcoholic looks forward to social outings as an excuse to drink, so do I look forward to being a passenger in a car as an excuse to try just one more time to beat level 63. For the entire seven hour drive from Utah to Colorado, I was crushing candy. "But wait," you other crushers are probably saying, "How do you play continuously when the game only provides five lives at a time before making you wait another thirty minutes? You're not actually paying for more lives, are you?" Please. No. I'm addicted, not stupid. I've gotten around the life reloading waiting period by downloading the game on three, yes three, different devices. My phone, my ipad, and Stephen's phone. Do I feel shame in asking Stephen for his phone when I've maxed out my lives on the other two machines? Yes. Does it stop my from asking? No. While I haven't spent any actual money on extra lives or boosters, it's a high price I've paid. It's my dignity I've lost. My ability to live my life without an intense desire to see a screen full of colorful shapes explode in sugary confetti. My nights that were spent dreaming of something other than rows of candy collapsing in on each other, a feeling I chase like a junkie does a high. "I'll stop playing when I've beat the game," I tell myself. But I'm starting to think there is no end. A thought that both excites me and scares me. Now if you'll excuse me, I've done a really great job writing this post and I deserve a treat. I'm coming for you, level 65. This describes my entire long weekend so accurately it's scary. That's what I strive to do. Scare with accuracy.